Dog owners are required by State law to obtain an annual license for any dog more than 5 months of age or within 30 days of acquiring ownership. Licenses may be obtained in person or by mail from the Village Office by April 1 of each calendar year. A current rabies vaccination certification from the veterinarian must be provided with the license form and fee. Owners must keep their dog on a leash, when outside of their property. Any stray dog(s) running at large within the Village may be impounded by the Wind Point Police or their designated agent, or delivered to the local Humane Society or animal shelter. In order to keep the Village clean for everyone, dog owners are required to pick up after their dogs when walking them. Please remember to bring a scooper, bag or other method for clean up when walking your pet. It is unlawful for dogs and cats to create a public disturbance, either from continual noise or from dangerous behavior. If you find a stray animal, or if you lost a dog or cat, contact the Wind Point Police Department at 262-639-3022. 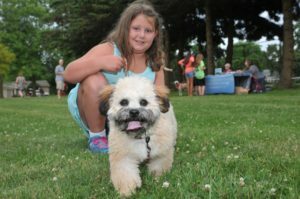 The Village of Wind Point contracts with the Wisconsin Humane Society-Racine Campus to provide animal sheltering services. Visit www.wihumane.org for more information about stray animals, wildlife rehabilitation and other resources. Many different types of wildlife have been spotted in Wind Point, including deer, coyotes and foxes. Occasionally the Village receives calls from residents concerned about coyotes. 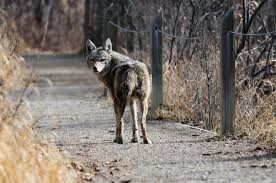 Coyotes are generally not aggressive towards humans, as they have a natural fear of people. However, urban coyotes may be bolder towards humans as they are more likely to associate humans with an easy and dependable source of food than their rural counterparts. Remember, coyotes are wild animals and should be treated with respect. If you see one, keep your distance and do not leave small children unattended outside. If you are approached by a coyote, don’t turn your back and run. Shouting, making loud noises, waving your arms, maintaining eye contact and throwing small stones are all proven techniques for making the coyotes flee or ending an encounter. Residents can discourage coyotes from living in and traveling through this area by eliminating easy food sources on their property. Coyotes generally will not prey upon or act aggressively towards domesticated animals when their natural food sources are plentiful and they have large territories; however these factors are often different in urban areas. You can reduce the risk of your dog encountering a coyote by keeping it on a short leash, supervising your dog when it’s off-leash in your yard and by walking your dog at times and places with high pedestrian traffic. Wind Point does not allow the discharge of firearms or bow and arrows within the Village for the purpose of hunting coyotes. Residents may trap coyotes if they hire their own licensed, private contracting service to carry out the trapping activities on their own property.